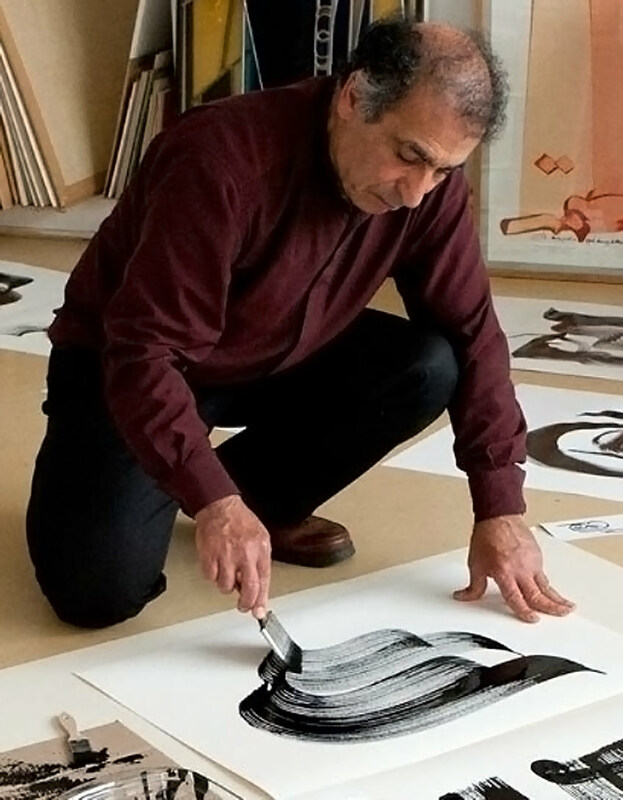 Hassan Massoudy drew calligraphies from his earliest age. Hassan Massoudy was born in 1944 in Najef, South of Iraq, a town surrounded by desert and whose monuments are all covered with calligraphies. He drew sketches and calligraphies from his earliest age. In 1961, he left for Baghdad and started working as an apprentice for various calligraphers. He visited exhibitions of modern art which fascinated him and from then on, started to dream of artistic studies. The unfolding political events and ensuing dictatorship prevented him from doing so. He eventually left Iraq for France in 1969, freed from the oppressing regime but heartbroken. He got to the “Ecole des Beaux-Arts” of Paris where he first worked on figurative painting. But to pay for his studies, he went on drawing calligraphy. Over the years, calligraphy progressively got into his figurative painting and eventually took its place. In 1972, he created the show “Arabesque” with the actor Guy Jacquet and later on the musician Fawzi Al Aïedy. Arabesque was a public performance combining music and poetry together with calligraphies being performed and projected on a large screen. Over the years, it brought more spontaneity in his gesture and a more instantaneous way for him to express himself. This experience marked a definite turn in Hassan’s work. The drawing of his calligraphy became swifter and his gesture richer. Traditionally Arabic calligraphy is done with black ink. To better express himself, he broke from the tradition and introduced other colors particularly on his work on large size paper. His art retains the nobleness of the artisan, worshipping his own tools. Besides, he both goes on performing live creations and improvisations and takes part in collaborative shows, like Métaphore, which mix in harmony music, dance and calligraphy, with dancer and choregrapher Carolyn Carlson and ney player Kudsi Erguner. Creations from Hassan Massoudy are a subtle mix of present and past, oriental and occidental art, tradition and modernity. He perpetuates tradition while breaking from it. Over the years he has purified and simplified the lines of his drawing, which takes its source from words and sentences of poets, writers or popular wisdom. The lightness and the purity of his lines provoke a strong emotion.